A couple of months ago, we wrote about the group of Viper ACR enthusiasts from America who raised enough money to fly the vehicle out to Germany so it could lap the Green Hell. Initially, their goal was to hit a sub-seven-minute goal, but they were a little shy of this by finishing the Nurburgring in 7:01.3 last week. They still got to break the existing record of 7:03.45, making the ACR the fastest street legal Dodge Viper ever that hit the Nurburgring. 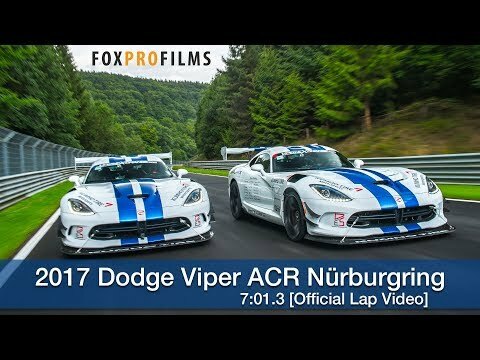 Road & Track was in Germany that time to witness this record breaking act by the Viper ACR, and they also witnessed the car go through some serious hiccups. The first incident was from a seized differential that occurred earlier in the week, which was then followed by a high-speed tire failure after the second lap, which led to a serious crash that happened right after the Viper ACR finished the lap. Luckily, both drivers came out of the car with no injuries. If you would like to see the record-setting lap, you could always check out the video online. So far, the Viper ACR is the fifth fastest car that has gone around the Nurburgring, at 7:01.3, being just behind the Lamborghini Aventador SV with a 6:59.73 lap time in 2015. But it actually did pretty well compared to the Nissan GT-R Nismo that has a lap time of 7:08.68, as well as the new Mercedes-AMG GT R that has a 7:10.92 time. Furthermore, it did pretty well compared to the previous-generation model that had a record time of 7:12.13 back in 2011. This all started back in January when the group started crowdfunding for the Viper campaign, after a group of men saw two brand-new stock Viper ACRs that had the appearance of a GTS-R and thought that they could take the vehicle to the Green Hell. Not only did a number of individuals help out with the cost, but the Viper was also actually sponsored by Kumho, which provided free tires. The two Vipers were purchased by some individuals at a Texas dealership Viper Exchange. Take note though that these Vipers were totally unmodified when they did the record attempt. We are all aware that production of the Viper is coming to an end, and there is a high chance that we will not see another Viper ACR go on the Nurburgring - at least in the near future. However, rumours have been circulating that a new Viper might actually be in the works. And since technology is improving, then we can expect the next generation Viper to be much quicker.